February 8, 2010 / Kennedy Space Center, Merritt Island, Florida -- After spending more than 4 hours waiting, the first attempt at the launch of Space Shuttle Endeavor was scrubbed 10 minutes before the liftoff at 4:29 AM on Sunday February 7, 2010. So we did it all over again 24 hours later and were able to witness successful launch on Monday, February 8, 2010 at 4:37 AM. We chose to watch the launch from Space View Park in Titusville, FL which is about 10 miles due west of the launchpad. For the first night, it was crowded with a party atmosphere, however for the second night, the crowds were way down and much more intimate. On both nights there was a loudspeaker system with NASA-TV monitoring the communications and a kiosk with 13" TV's for those lucky to be close enough to watch (we were on the second night). The view from Space View park has an unobstructed line of sight to the launchpad, the obvious focalpoint of the event. 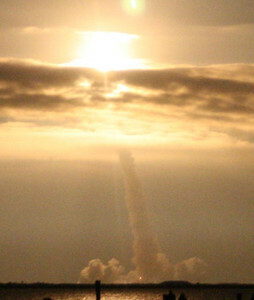 The bright, powerful xenon spotlights pointing skyward illuminated the low cloud layer which had ultimately scrubbed the first launch and threatened to do the same to the second. It was enough to keep the anticipation growing for me. Having watched so many of these launches on TV, it was quite surreal to see even this in person. As the clock drew closer to the launch, the excitement rose. We had secured a place at the railing of a little dock/pier structure where I was able to place my camera to avoid shaking (it was pitch dark). The crowd started gathering close by to where it was pretty dense. Finally, the countdown got to less than a minute, and we could see the glow on the horizon. At just a few seconds before launch, the glow turned into a brightness that lit the nighttime to almost daylight. It was quite incredible. Once the orbiter began to lift off the ground, the light directly underneath was too bright to look at. And then the sound... Being 10 miles away, there was a significant delay before the soundwaves arrived. When they did, it was so intense that we could feel it through our whole body. By this time the launch was well underway with the ship into the cloud layer which almost scrubbed this launch. When it got to these clouds, the light radiated through the clouds brightening the area to about what you'd see at mid dawn or dusk with a slight yellowish tint. And then it was over... The Shuttle progressed on it's southeast tragectory until it was just a pinpoint of light and the area turned back to night. We could continue to see the pinpoint for several minutes as it was several hundred miles away by then until it simply disappeared into the distance. And the crowds dispursed. In summary, it was an experience that was full of anticipation, hit a climax of success and then quickly was over. I wanted to see it again right then. Then it sinks in that there are people in that thing and they are on the ride of their life. The mission that they trained for over a year for has begun. For the next 13 days I was lucky enough to watch their docking, spacewalks, interviews, construction of the Cupula and other events until they undocked and made their safe trip home. By the time they landed, we had traveled 200 miles south to Homestead, Florida at the tip of Florida. The Shuttle had traveled several million miles, but had been at an altitude of about 216 miles for the majority of their trip. Scheduled for February 7, 2010 at 4:39 AM, this will be the final night launch of the space shuttle program. This mission will transport Tranquility, the final US built module, to the International Space Station (ISS) along with the Cupula, a 7 pane window outcrop for use with the space shuttles' robotic arm. STS-130 (ISS assembly flight 20A) is the next scheduled space shuttle mission to the International Space Station (ISS). This 32nd flight to the ISS will use Space Shuttle Endeavour, and is currently targeted for a 7 February 2010 launch. Launch time is 4:39 A.M. EST. The primary payloads are scheduled to be the Tranquility module and the Cupola, a robotic control station with six windows around its sides and another in the center that provides a 360-degree view around the station.